I've noticed a couple of posts lately telling how some folks are enjoying minor league baseball games this summer as a family-friendly and affordable alternative to high-priced Major League games. Baseball season is winding down soon, so let me offer another alternative for those seeking affordable family fun and fast-paced sports action--Junior Major Canadian Hockey League (CHL) games! 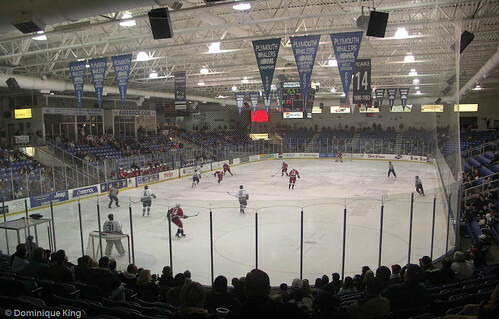 The CHL includes teams in Maine, Oregon, Washington, Pennsylvania and Michigan as well as teams from all over Canada. Team players are 16- to 20-year-old athletes at the beginning of their professional hockey careers, so you'll see a high level of play and watch at least a few players who will eventually play in the National Hockey League (NHL). The Ontario Hockey League (OHL) is part of the larger CHL. Regular readers of Midwest Guest know that I'm a big hockey fan, and we own season tickets for the OHL Plymouth (Michigan) Whalers. 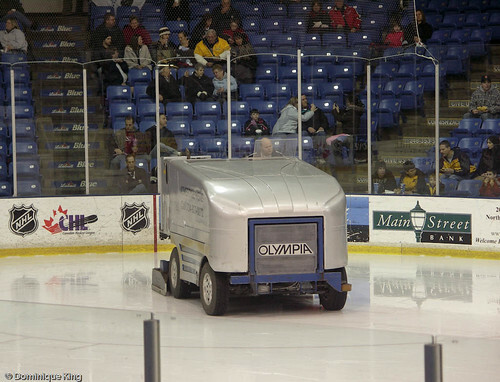 Did I mention that I've always wanted to ride an ice resurfacing machine? Whaler games draw lots of families with affordable tickets and special value or group packages. 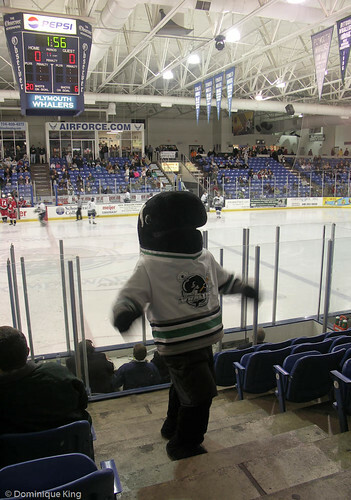 Kids attending Whaler games enjoy interacting with Shooter, the team mascot. You may meet up with Shooter in the stands, and some lucky kids may even get to join Shooter on the ice for a little one-on-one hockey. Check out my post from yesterday for a few more hockey action shots, and find out what I like so much about Whaler games! Also--missed out on BlogHer swag? Check out Tuesday's post for a chance to score a little kid-friendly swag I picked up at BlogHer. It's all part of my lucky 13-month blog anniversary celebration. I love the kid on the ice! My brother was a huge hockey player when he was in highschool and we used to go with him all the time but that was like 10 years ago. I actaully miss going to a game. I like the fights the most! Nice pictures! I would love to see a Hockey game, but unfortunately Hockey is not so big over in Europe. Thanks for sharing I am a sports fan, all sports! As a Jerseyite, I love hockey, but don't think to get out to games very often. Thanks for the reminder as the season ramps up and we look for fun things to do indoors! Maria V-I thought the kid on the ice was a cute photo, too. 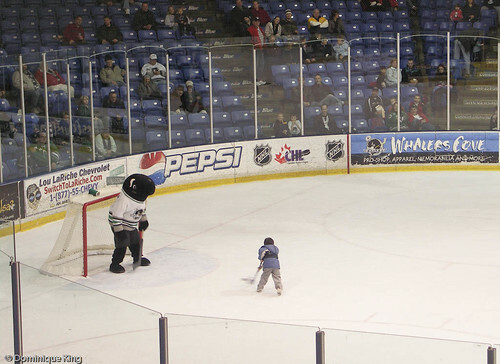 The Whalers are very family-oriented and try to have some cool between-period entertainment for kids. I like it when they have the kids' hockey teams in for a short exhibition between periods--usually grade-school age teams...some are tiny, tiny and just learning to stand up on skates! Maria-Sorry you don't get to see a lot of ice hockey in Europe. I like the fast pace of the game, and we really enjoy the fact we get to see so many games in person. Wanderluster-If you can find a decent junior-level or high school team, it can be a pretty affordable way to go to a sports event. Our regular home season games start in a couple of weeks, and I'm looking forward to that.